Hertfordshire Publications was founded 40 years ago and became an imprint of the University of Hertfordshire Press in February 2001. It publishes local history books in association with the Hertfordshire Association for Local History (HALH) whose membership includes both individuals and local history societies in Hertfordshire. Members receive a discount on the retail price of books published in the series. 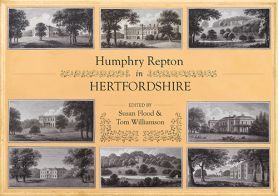 The imprint is confined to the publication of books on the history of Hertfordshire. Only books of county-wide interest will be accepted for publication. This would in most cases exclude parish histories. We would normally expect manuscripts to be not less than 40,000 words long. Fabian Hiscock considers the dramatic technological and economic changes of the last decade of the eighteenth century as it played out in western Hertfordshire, focusing in particular on just one of the many innovations of the time: the Grand Junction Canal, created to connect the Midlands with London. This meticulously researched book opens a window onto Tudor and early Stuart Hertfordshire and illuminates a significant aspect of the county’s landscape history. This comparative study gathers together new research by local historians into aspects of welfare in Hertfordshire spanning four centuries. Printed in full colour, and with a fold-out parish map, the Historical Atlas is an essential tool for the local historian and anyone with an interest in this fascinating county. This book focuses on the lives of working children in nineteenth-century Hertfordshire employed in agriculture, straw-plaiting, silk-throwing, paper and brickmaking and as chimney sweeps. Lavishly illustrated with maps and photographs, this authoritative work will be invaluable reading for all those with an interest in the history, archaeology, and natural history of this fascinating county. Presents complete transcriptions of all the key documents relating to Repton's activities, including the full text of seven Red Books. This study examines the reality of life on the Home Front in St Albans during the First World War. This study of the small cathedral city of St Albans offers a rare insight into social change in a typical English community between 1650 and 1700. Greatly expanded and extensively revised, this book examines the history of Hertfordshire from late prehistoric times to the thirteenth century. Stephen Ward reassesses the legacy of Ebenezer Howard. This practical and comprehensive guide provides an indispensable introduction to everything family historians need to know in order to trace their ancestors. Heavily illustrated with both historic and contemporary photographs, this book acts as an invaluable guide to Hertfordshire's mills.